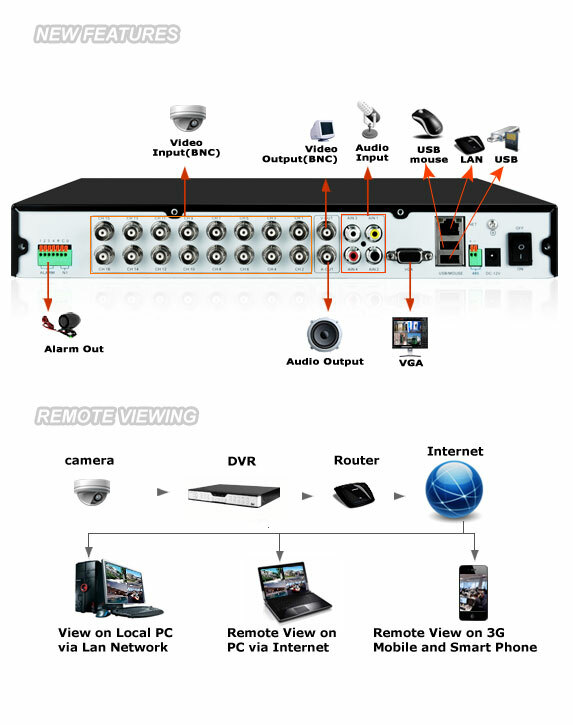 The ZMD-DC-SBN6 is one of the latest 16CH standalone DVR featuring advanced security functions. With the capacity to record with 16 cameras, it is highly recommended for businesses. It provides the basic surveillance function at an affordable price for your security and surveillance needs. With ZMD-DC-SBN6, you’re able to know what is happening at your home or business wherever and whenever you want. You have the power to access your DVR’s live video footage over the internet or directly from your supported smart phones, including Android™; )iPhone® & iPad® IOS; Symbian™; Windows Mobile®. ZMD-DC-SBN6 The motion detection option allows you to record only when motion is detected so that you save hard drive space without missing important events. You can even ensure that false alarms are not triggered as the easy motion detection “mask” allows you to block out areas with constant movement. Once motion detection meets alarm conditions, an email will be sent immediately with the attachment of the snapshot. Once the FTP is set, it will upload the file after the alarm, and the FTP server will receive the snapshot. For the price, this DVR is amazing. I had to replaced my pc base dvr card with this because I was happy with the results. Will surely recommend this product. Remember you will need a hard drive. My item was shipped fast but the package was missing the housing screws which I am still waiting for the seller service. So far so Good!